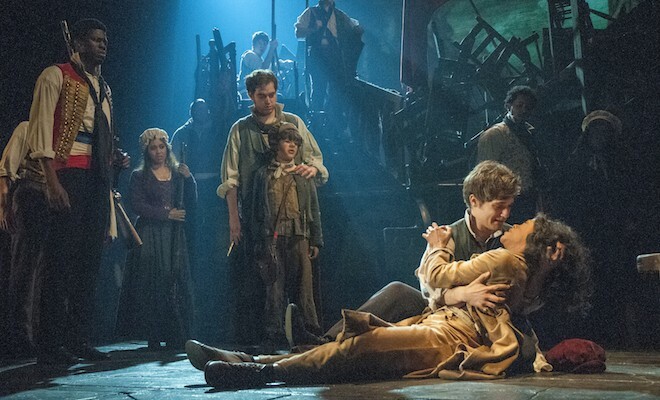 New York, NY – Cameron Mackintosh’s acclaimed new production of Boublil & Schönberg’s LES MISÉRABLES will welcome several new cast members for its second year on Broadway beginning Tuesday, March 3 at The Imperial Theatre (249 West 45th Street). Joining the cast are Tony and Oliver Award nominee Gavin Lee (Mary Poppins) as Thenardier, Erika Henningsen as Fantine, Rachel Izen as Madame Thenardier, Brennyn Lark as Eponine, Chris McCarrell as Marius and Wallace Smith as Enjolras. Tony Award nominee Ramin Karimloo will perform as Jean Valjean through the end of the summer; Will Swenson, as Javert, and Samantha Hill, as Cosette, will continue in their roles as well. Current cast members Caissie Levy (Fantine), Andy Mientus (Marius), Cliff Saunders (Thenardier), Kyle Scatliffe (Enjolras) and Keala Settle (Madame Thenardier) will play their final performance Sunday, March 1. Erika Henningsen (Fantine) is making her Broadway debut in LES MISÉRABLES. New York: Show Boat (Kim), “Live from Lincoln Center” with the NY Philharmonic. Regional: Diner (Beth) world premiere at the Signature Theater. Graduate of the University of Michigan, BFA Musical Theater. Brennyn Lark (Eponine) is making her Broadway debut in LES MISÉRABLES. She is a recent graduate of AMDA, The American Musical and Dramatic Academy. Chris McCarrell (Marius) made his Broadway debut with this production of LES MISÉRABLES as a member of the Ensemble. Television: “Peter Pan Live!” (NBC). Regional theatre: Bubble Boy (Bubble Boy), Summer of ’42 (Hermie), Next to Normal (Gabe), Sweeney Todd (Anthony), Pippin (Lewis). Wallace Smith (Enjolras) Broadway: Rocky (Apollo’s Manager), Godspell (Judas), American Idiot (Favorite Son), The Lion King (Adult Simba), Hair (Hud), Ragtime. Off-Broadway: MTC’s Choir Boy. Regional: Old Globe’s Jeff Buckley musical The Last Goodbye, Whoopi Goldberg’s White Noise. TV: “Crime,” “Elementary,” “Person of Interest,” “Blue Bloods” and more. There are over 3,000 productions of the LES MISÉRABLES School’s Edition scheduled or being performed by over 150,000 school children in the UK, US and Australia, making it the most successful musical ever produced in schools. Tickets to LES MISÉRABLES are available at www.telecharge.com or by phone at (212) 239-6200 or (800) 447-7400. Ticket prices range from $37 – $147.